The Energy and Environment Foundation organized the 8th World Renewable Energy Technology Congress & Expo-2017 from 21st to 23rd August, 2017 at the Convention Centre- NDCC, New Delhi, India. The theme of the event was “Renewable Energy: Global Cooperation for Sustainability”. The event witnessed participants from Australia, Belgium, Canada, France, Germany, Italy, Japan, Switzerland, UK and USA apart from the key executives of many renewable energy companies. The Awards Committee of the Energy and Environment Foundation gave Dr. R. Seetharaman, CEO of Doha Bank the “Energy and Environment Foundation 2017 Global Excellence Award in Renewable energy “on 21st August 2017 for his vision, leadership, outstanding contribution and for demonstrating excellence in the Renewable energy sector. 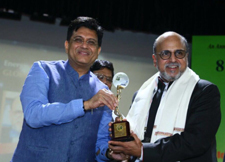 Dr. R. Seetharaman received the Award from Mr. Piyush Goyal, Minister of State with Independent Charge for Power, Coal, New and Renewable Energy and Mines in the Government of India and stated that this award is an acknowledgement for the efforts undertaken by him through Doha Bank in various renewable energy projects as part of sustainable development philosophy. The other recipients of the Global excellence award include Dr. Martin Keller, Director, National Renewable Energy Laboratory, US Department of Energy, USA, Mr. Dolf Gielen, Director, Innovation and technology Centre, International Renewable Energy Agency, Germany, Dr. Lawrence E. Jones, Vice President, International Programs, Edison Electric Institute, USA and Mr. Pranav R. Mehta, Chairman, National Solar Energy Federation of India respectively.